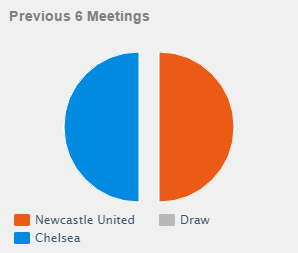 Newcastle United will host Premier League leaders Chelsea today in an early kick off at St James' Park. Chelsea are six points ahead of second place side Manchester City, a defeat will not steal their place. Newcastle United will welcome Jack Colback and Moussa Sissoko today as they suffered suspension in the midweek. Manager Alan Pardew is likely to give skipper Fabricio Coloccini a rest as he has a slight hamstring injury while Sammy Ameobi, Daryl Janmaat and Mike Williamson are doubtful for this clash. Meanwhile for Chelsea, Diego Costa will be taking his role back after missing the clash against Tottenham through suspension in the midweek. Centre-back Gary Cahill is fit to play but Nemanja Matic has to suffer a suspension. John Obi Mikel is the likely one to take his role. Newcastle have not scored a goal in the first quarter of the match this season in the Premier League. The home side have lost a single game in their last nine Premier League fixtures. Chelsea are unbeaten this season in all competitions. Blues star player Eden Hazard has scored four goals in three games against the Magpies. 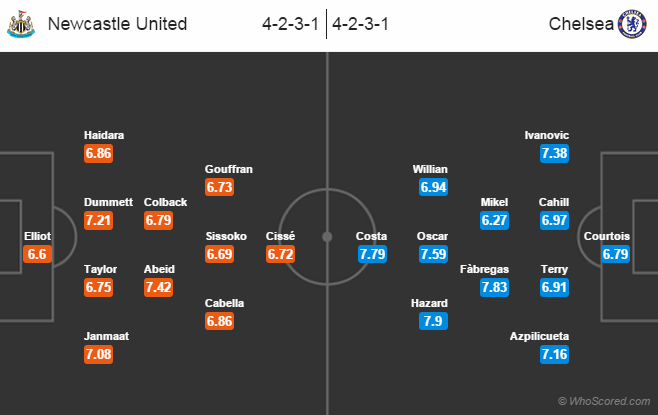 Newcastle United 1 – 3 Chelsea, Costa on the score sheet.